Bishop castle is located near Beulah, Colorado. Jim Bishop is building it on a mountainside overlooking Rt. 165 south of Canon City. 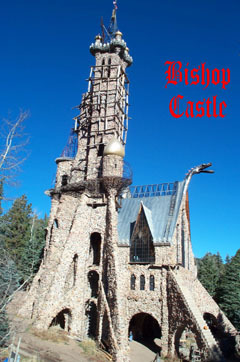 Mr. Bishop has been working on his castle since 1969.
http://www.BishopCastle.org This is the official Bishops Castle website, it has a lot of information about how this marvelous building is being built by one man. The site also contains information about how you can visit the castle, have a wedding at the castle, etc. Visit the Roadside America website for more information. Visit another website for more information. Bishop Castle is an Instant-Inspirational Masterpiece of Inter-Active Artwork. The Castle is a 501 [C] 3 non-profit foundation providing FREE entertainment to all who pilgramige to our small kingdom. Last year 90,000 people sign the guest book during the tourist season. Bishop Castle as a monument has been dedicated to hard-working poor people and all hard-working Americans, working for a better Nation. Unlike most of the other structures mentioned on your site Bishop Castle stands alone. This American Masterpiece has always been a Castle and not a private palacial estate built my the paid workers for their rich Overlord . Secondly this is the most unique Real Castle ever built because it is being built by only one man, one poor man, working for the last 37 years. The "Castle Builder" continues his solo sculpture adding the huge Castle walls that will surround the Monument. Bishop Castle is still just a baby but already eclipses all other American Castles. What will Bishop Castle become in the next 500 years? Who know? but if you happen to come and stand at her base you will start to understand how incredible this project is. Photo courtesy of Daniel Bishop.